This is going to be an ongoing series, these letters are addressed to a reader named “Timmy.” With these letters I hope to express my respect and admiration for the other side of the political spectrum, while also laying out the reasons I put myself on the opposite side of the political spectrum. I hope to focus more on philosophy than on empirical facts, because it saves me the research (which takes time). One of the great difficulties in political and ideological discourse is maintaining civility. The one thing people have proven about themselves over the years is their ability to remain at each other’s throats for the smallest infraction or difference. This willingness to take a discussion to the lowest denominator is one I’m sure everyone is guilty of, and thanks to the internet it has gotten a lot worse. However, for this correspondence I have complete confidence we can remain civil. The first subject I wanted to talk about was the media. You mentioned in one of your comments that you were interested talking about the media. For a long time now conservatives have been complaining about media bias. Yet many liberals will watch the news and they won’t detect any bias at all. They will sometimes even see a right-wing bias to the news. There has to be some sort of answer, either the media is right-wing, left-wing, objective or some combination thereof. The simplest explanation would be that conservatives and liberals watch the same objective media. Because the media truly is objective, liberals see reporting that is to the right of their viewpoints, and conservatives see reporting that is to the left of their viewpoint. But is this idea true? It appears not. There are numerous studies showing newsreporting has had a liberal bias. Of the many, a good example is the study done by Professors Tim Groseclose at UCLA and Jeff Milyo at the University of Chicago. They showed the media reported findings from liberal think tanks more often than conservative ones. They also tried to assign ADA scores to various media outlets. Not surprisingly, they found most media sources had a liberal score except for FoxNews, which had a right of center score. The media not only reports the news in a biased way, they themselves are biased. Depending on which study you cite, the media (newspapers and television broadcast) votes for democrats at rates between seventy and ninety percent. The media denies this, and there are some studies that try to show a lack of a media reporting bias. Fairness and Accuracy in Reporting (FAIR) has a study that reports that journalists are socially more liberal than the rest of us, but they are more fiscally wealthy, thus more fiscally conservative and more pro-corporation than the average American. This study is flawed in several ways, not the least of which is the fact that it relies upon journalist surveys. The journalists who were chosen for the study had to fill out a survey and return it to FAIR. If you ask any journalist if their reporting is biased, they will tell you no. It works the same way in self report surveys like this. Self reporting is its own giant confound, and this study fails to actually analyze the reporting itself. It also fails to analyze how journalists actually vote. It makes sense that members of the media would try to portray themselves as more centrist or moderate than they really are, for they have heard the complaints about media bias for a long time too. We shouldn’t be surprised at any of this. Journalism is another liberal arts degree, and conservatives have a very poor record when it comes to liberal arts enrollment. Most people who go into Journalism in college are liberals, most conservatives go into different majors like business and economics or even engineering. I know this empirically, for I too spent some time in the journalism school at the U of M, where I had professors admit to liberal media bias in television and print. I didn’t stay in journalism, but I had a friend who did, and he told me nightmarish tales of what it was like to be an open conservative in that department. For me though, all of what I have stated above is becoming a very moot point. The growth of alternative media is making it possible for people to get their news from sources other than the liberal media. The rise of cable news networks and talk radio have given everyone an alternative source. Major market newspaper circulations have been in decline as the Internet has grown in prominence and importance. More and more people are exercising choice in where they get their news. This should be a development that liberals and conservatives alike should embrace. An open and engaging society of dialogue, one where people have numerous choices on where they get their information should be the ideal. There should be conservative and liberal sources of information, there should be moderates and centrists. There should be different philosophies towards reporting the news, where some admit their bias but try to report objectively, and others simply abandon the ideal of objectivity. It’s called a marketplace of ideas, and it’s the foundation of a free society. The best part is, it’s happening right in front of our Timmy. Most people throughout history have been limited in their ability to disseminate their ideas. Printing presses are expensive. TV stations were limited and expensive, Even radio is an expensive endeavor. But thanks to the Internet, bloggers and podcasters are getting their voices heard and are adding to the information marketplace in the most democratic way imaginable. The only cost to bloggers is access to the internet and time. Conservatives no longer need to complain about liberal media bias, we need to change the message. The message shouldn’t be “change the media” but “be the media.” We don’t need to attack viewers of the major networks, we need to convince them to enter the blogosphere. Really, the battle over mainstream media bias is over. The evidence is in, the media is biased. Conservatives have mostly moved on, a few still uncover media bias when they see it. For me though, it’s not important at all whether you acknowledge whether the media is biased, I want you to embrace the new media. If enough people embrace the new media, it will force the old media to change. I think this is something you and I can get behind Timmy. You might be, and I know your liberal brethren are, worried about the corporate nature of the mainstream media. I and my conservative brethren are concerned over the liberal bias of that same media. Now we both can bypass the mainstream media altogether. The mainstream media isn’t going away, but it does need to change. Don’t you agree? A total daredevil, you’re the reindeer with an edge! I have written about the gift ideas for you cheapskates out there. Now I have a few items for those readers of mine that have too much money. You know, the people who spend 8 dollars on a cup of coffee and thirty dollars a week feeding their cats. These people seem to take pride in their irrational extravagance. I only want to help. 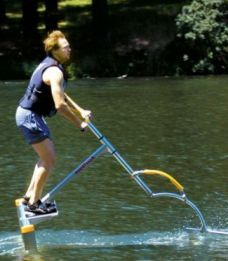 …this unique hydrofoil frame allows you to skim across water simply by hopping gently up and down, propelling you as fast as 17 mph (more than four times faster than some world champion freestyle swimming speeds). At only 26 lbs., the lightweight aircraft aluminum and fiberglass frame is easy to transport to a dock or boat for launch. Wide steps and handlebars allow confident control as your own hopping motion lifts the hydrofoils to skim quickly across a lake; the aquaskipper also provides a brisk cardiovascular workout. Virtually maintenance-free, it has no moving parts or noisy engines that require fuel. …this is the world’s only aquatic pod suite that offers panoramic views simultaneously above and below the surface of the water. 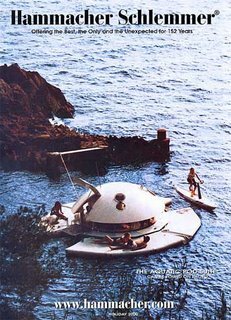 Circular, with a ‘flying saucer’ aspect, the suite rests directly on the water, the lower portion submerged approximately five feet. Perfect as a getaway at a favorite lagoon, beach, lake or river, the suite offers spectacular 300° views of the environment. Beam lights illuminate the depths for viewing the aquatic surroundings after dark. With a 150 square-foot interior, the self-contained, circular suite has all the furnishings for two people to enjoy on-the-water living. This wouldn’t be a bad little home for someone, though I’m fairly sure it wouldn’t survive a Midwest winter. But if water ain’t you thing, don’t feel bad. I have more ways of wasting your money. How about an exact replica of Robby the Robot? 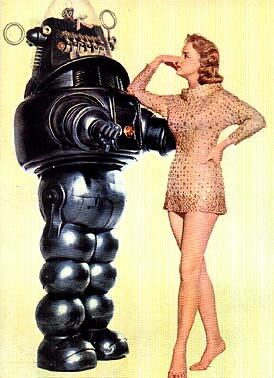 Robby the Robot would have a number of roles in TV and Cinema after his creation for the film “Forbidden Planet” (starring *snicker* Leslie Nielson). 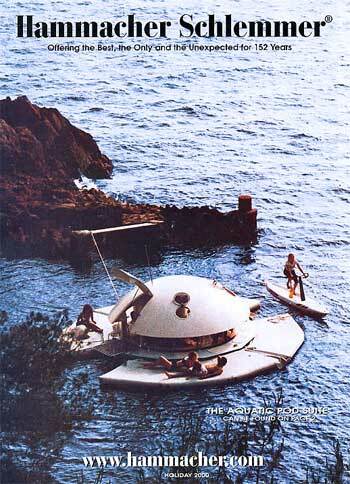 At the time, Robby the Robot was the most expensive movie prop ever built. And now he can be yours for, well, about the same price. It was a dark time for the Rebellion. Imperial troops had pursued the Rebel forces across the far reaches of the galaxy to the remote ice world of Hoth. Leading the attack was one of the Empire’s most devastating assault weapons – the fearsome All Terrain Armored Transport (AT-AT). Legions of film-goers watched in awe as the AT-ATs thundered towards Echo Base in one of the most memorable sequences in motion picture history. Recreated from a direct study of the surviving miniatures in the Lucasfilm archives, the AT-AT Studio Scale faithfully reproduces the details of the original filming miniatures and includes a snowscape diorama, complete with Luke Skywalker’s crashed Snowspeeder (cast directly from an ILM miniature). Each model is comprised of over 230 separate parts! The AT-AT will demand respect on any desk or shelf. 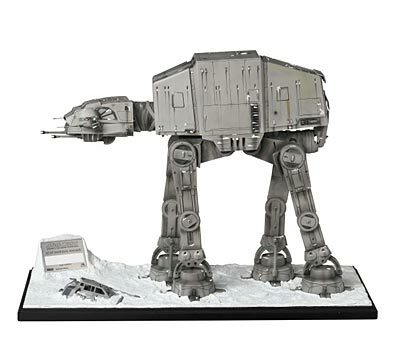 • Faithfully reproduces the original 19-inch high filming miniatures as seen in The Empire Strikes Back. The best part is you can actually crush Luke Skywalker and end the threat to the Empire (and thus improve the watchability of the original trilogy dramatically). And if I ever receive such gifts? I’ll sell them and buy gift baskets for everyone I know.